European Commission President Jose Manuel Barroso has acknowledged that the EU will not have a constitution for "at least two or three years". He said that the text was unlikely to be ratified in the near future, after French and Dutch voters rejected it. 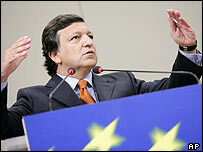 However, Mr Barroso said this should not mean paralysis in Europe. He said it was important to convince citizens of the relevance of the EU by creating jobs, improving security and protecting the environment. "In all probability, at least for the next two or three years, we will not have a constitution," he told reporters in Brussels. The failure of referendums in France and the Netherlands earlier this year led an EU summit in June to call for a period of reflection, rather than risk further rejections in other countries. "There hasn't been much reflection so far," Mr Barroso said. "We haven't seen many initiatives." The Commission spent Tuesday "brainstorming" at a chateau in southern Belgium about the future of Europe. Mr Barroso insisted on Wednesday that the EU should not be nostalgic for the constitution, but should make the most of the existing treaty framework. "Let's get things done that ordinary people can see and appreciate," he said. He added: "We don't want a mediocre, defensive Europe that tries to bury its head in the sand to avoid the realities of the 21st Century." As if to emphasise Mr Barroso's refusal to slow down, the Commission issued a raft of proposals on Wednesday, on counter-terrorism, atmospheric pollution, funding for research and state aid for innovation. Mr Barroso urged the UK, which holds the presidency of the European Council, to make progress on solving a row over the EU's 2007-2013 budget. He said this would give a crucial signal that the EU could go forward. The problems over the constitution and the budget provide the backdrop for an informal summit of European leaders at Hampton Court in London at the end of October. The UK presidency says this will focus on how to provide social justice and competitiveness in the context of globalisation, and how to make policies in areas such as justice and home affairs, foreign policy and defence work better.